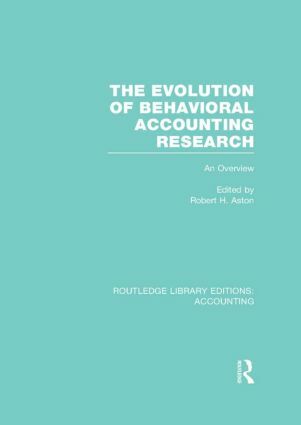 a comprehensive perspective on the development of behavioural accounting research in the 1980s including discussion of the division of behavioural accounting research into two branches. Introduction 1. The Impact of Budgets on People Chris Argyris 2. Distinguishing good from Not-So-Good Accounting Reseach Robert N. Anthony 3. Tentative Statement of Cost Concepts Underlying Reports for Management Purposes Committee on Cost Concepts and Standards, American Accounting Association 4. Cost Concepts for Control Robert N. Anthony 5. Behavioral Science and Accounting Research David O. Green Appendix A: Table of Contents from Accounting and its Behavioral Implications Edited by W. J. Bruns, Jr and D. T. DeCoster Appendix B: Evaluation of Behavioral Research in Accounting Nicholas Dopuch Appendix C: Evaluation of Behaivoral Research in Accounting Selwyn W Becker Comments on a Paper by David Green William J. Bruns, Jr Comments on a Paper by David Green Jacob G. Birnberg Discussion Comments – Session 3 Historical Perspective on Behavioral Accounting Research Robert H. Ashton.